Previous postEmail Marketing - Is It Working For You? Successful online marketers earn most of their income using email marketing. People new to this business ask me questions all the time, how to get instant leads and sales? I always tell them to build an email list. All you need is a squeeze page and an autoresponder, this is where WP Profit Builder and AWeber fit in. As you read below I will be explaining how a squeeze works and what WP Profit Builder will do for you. Squeeze Page – What is it? Squeeze page is a one page website with an email opt-in, online marketers used them to collect email addresses from targeted visitors. After the visitor opts-in the email is sent to the marketer’s email autoresponder. Then the visitor will get access to the marketer’s product offer and will start receiving sequenced emails about future product offers. Regardless of what your website’s purpose is, ensuring your success relies on conversion rates. High quality traffic could be a worthwhile goal. However all of the targeted traffic on the internet is not going to matter if none of your visitors purchase a product, subscribe to your newsletter, or get in touch with you relating to your services. Skilled marketers can spend hours or even days designing, testing, and adjusting a single squeeze page to be able to improve their opt-in rate percentage. However not everyone is able to invest hours of work on improving one squeeze page. You can conserve your time and efforts by employing an expert to create a high converting squeeze page to suit your needs. However a custom style website page is usually excessively expensive. Many people just do not have the finances to invest into one page. So how could you increase your opt-in rate without spending countless hours or dollars? That dilemma is precisely what prompted internet entrepreneur Sean Donahoe to create WP Profit Builder. Discouraged with pricey solutions to constructing squeeze pages, he created a WordPress plugin to really make it fast and simple to generate highly effective and professional looking squeeze pages. Without having to break the bank. WP Profit Builder – What is it? WP Profit Builder is a plugin for creating high converting squeeze pages. 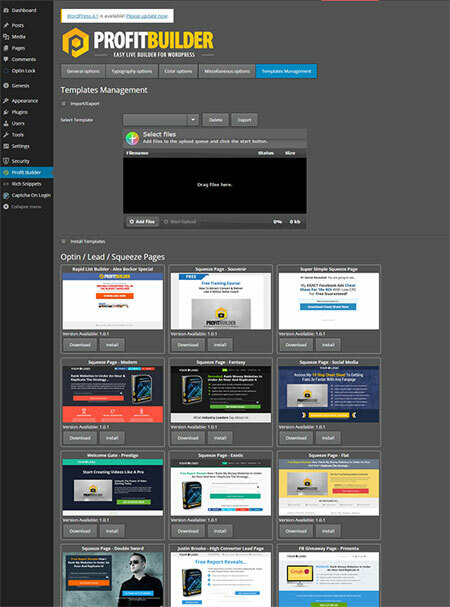 This WordPress plugin includes expertly designed templates for various page types. Along with a drag & drop editor that enables you to effortlessly construct your own designs or personalize the incorporated templates. This WordPress plugin works excellent together with any theme. So it’s not necessary to revamp your whole website just to use this plugin. However WP Profit Builder comes with an optional theme you should use. WP Profit Builder features a library with well over 60 templates you should use and modify. New templates are continuously being added and updated. There’s a couple of software and platform tools out there for creating squeeze pages. Why is WP Profit Builder different from the rest? The plugin is easy to install and very simple to create a professional looking squeeze page in 5 minutes or less. WP Profit Builder includes 60 plus templates to choose from for all kinds of landing pages. New designed templates are continuously being added and updated with no extra cost. You can customize any of the 60 plus templates or create your own squeeze page from scratch using the drag & drop editor. WP Profit Builder has a preview feature tab that makes it easy to view your published landing page without having to switch browsers back and forth. You can also add background videos to any page. Here is the best part about WP Profit Builder! There is only a one time payment unlike Lead Pages. If you are unsatisfied with this product for any reason, you have a no risk 60 day 100% money back guarantee. No questions ask. However I don’t think that is going to happen with this Brilliant plugin! I think anyone wanting to get a higher opt-in or conversion rate should definitely look into this amazing WordPress plugin!